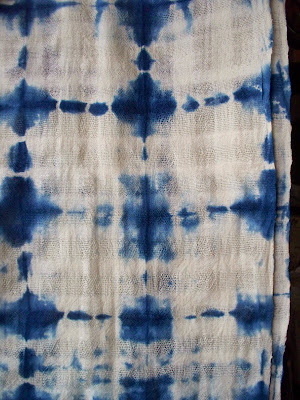 I’ve been spending a great deal of time this summer on my indigo processes; resist methods and dyeing. I do, however, try to sneak in a bit of time for some botanical printing. There were a couple of batches that I am particularly fond of. The colors and images just seemed to be in harmony. My favorite leaves for images are oak, pecan and sweet gum. There are other leaves,however, that leave wonderful tints and shadowy hints of their presence. Those are the leaves that give the pieces their overall look. I will admit not all the leaves are from my area. My sister-in-law does send me small periodic parcels containing a few of the leaves from her area in the Michigan woods. I happily include those in my compositions. 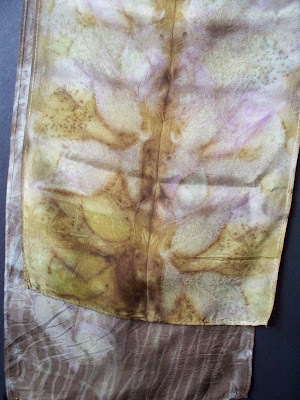 Due to other projects I haven’t spent much time the last month doing botanical printing on scarves. Paper printing, however, doesn’t take the same amount of time for preparation so I’ve managed to get some of that done. These prints were all done on 140lb (300g) watercolor paper that had been dipped in aluminum sulfate and steamed for 2-3 hours. They will make lovely cards. Perhaps a couple may end up in small frames. As I make more prints, I seem to be making more favorites (although there are still a number of ‘OK’ ones also). You try to plan for certain results but you still never really know until the piece is unwrapped. 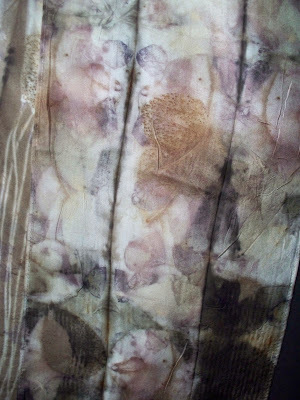 This scarf was in the same dye bath with my first paper prints. All the tannin (tallow leaves) and iron (pine needles), with a touch of vinegar and onion skins, does create some very dynamic prints. This scarf also had included some fresh hamelia patens (hummingbird bush) leaves that were starting to turn their winter red. They created some hints of green. Did print a few more papers with fresh botanicals. They turned out very delicate and subtle. Too difficult to get a good photo. The scarf I included in their dye bath will be ready to unwrap in a week or so. I’m trying to be patient. 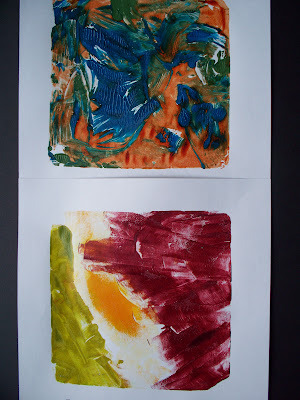 Have finally tried eco printing on paper. Used some heavy watercolor paper and leaves that had been soaking for a couple of days. Because of all the tannin, the prints were all shades of brown. The amount of tannin was so great it even overpowered the golden onion skins in the dye bath. 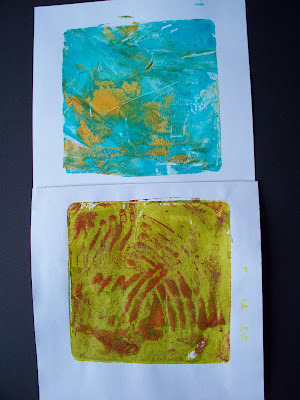 I did wet the paper in vinegar water prior to laying down the leaves although did not soak it. There was a lot of seepage from the dye bath. Next time I don’t think I’ll let the paper ferment for a couple of days. I believe perhaps maybe I’ll just let the paper sit in the bath until it has cooled. The shades of brown were a bit different due to the leaves used. Interestingly, even though there was a piece of waxed paper between each sheet, there is a ghost image on the back of each print from the page below it. Didn’t know waxed paper was porous. Below are the ghost images. Next I’ll try some fresh leaves and flowers. Hopefully, will get some color on the paper. We don’t get much in the way of fall foliage in Houston but I have been picking up a few leaves and combining them with some of our evergreen botanicals. Above is a print on a cotton/silk scarf. 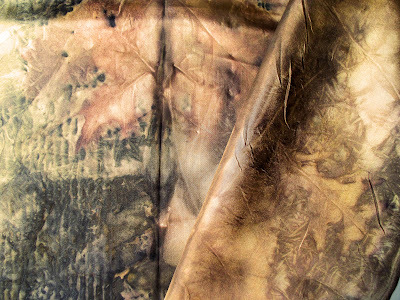 This was exclusively a ‘fall’ print of Mexican Buckeye and Tallow leaves. I went searching for all the red Tallow leaves I could find but, interestingly, they printed yellow. This scarf is silk chiffon and was printed with Turk’s Cap and Texas Star hibiscus leaves, fern and some ‘Wandering Jew’ leaves. These botanicals were all fresh from the yard. The prints were very pale so, after the scarf had dried, I dipped it into an iron bath. I like it much better even though it lost most of the pink coloration from the ‘Wandering Jew’. This was a silk habotai scarf that has a combination of yellowing Mexican Buckeye leaves, old oak leaves and some fresh asparagus fern. The result was good. I use a bit of asparagus fern in many of my pieces as it makes a nice resist. Depending on the combinations I plan on printing in a batch, I’ll try to include a piece of cotton fabric in the mix. Having these cotton pieces provides a ‘stash’ for future embellishing projects. The piece above had a wonderful oak leaf and a bit of my yellowing Mexican Buckeye (which only acted as a resist) and a bit of ‘Wandering Jew’. 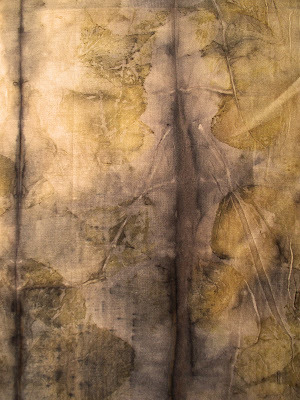 The color from the ‘Wandering Jew’ is on the fabric but too lightly to be seen in the photo. This is going to be a great piece to embellish. I have a few more pieces in the fermentation pot but it will be another week or so before I see them. Meanwhile, I’m anxious to get started on some paper printing. These are the final pieces for the CHH sale. The first scarf if one of my favorites. 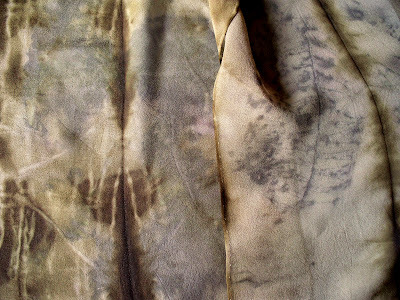 It is silk and has been eco printed with the autumn leaves of the Mexican Buckeye as well as some from an ornamental Pear. I added some fresh rose petals for a little more color. 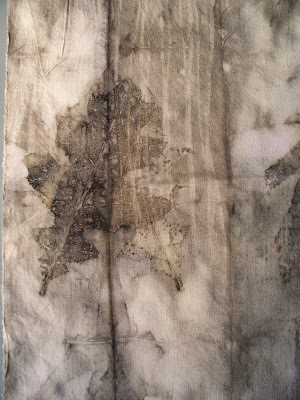 This silk scarf was eco printed with rose leaves and the leaves from the “Wandering Jew” (tradescantia pendula) plant. The final scarf was a fun indigo dye project. The beautiful cotton scarf was handwoven in Indonesia. I did a bit of folding and dipped it into an indigo pot. The color is gorgeous. Hope to see you all the the sale. The Contemporary Handweavers of Houston Annual Sale starts this Thursday (November 20th) and runs through Saturday (November 22nd). The location is 2315 Commerce and the hours are 10am until 5pm Thursday and Friday and from 10am until 9pm on Saturday. 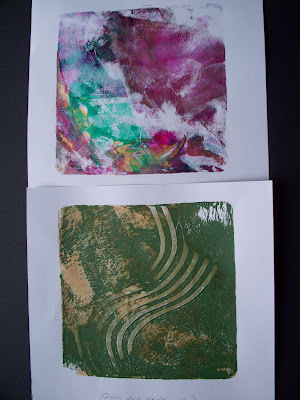 Finally broke down and purchased a Gelli printing plate. Think I felt the need to get ready for my selected workshops (signed up for 2 fabric painting sessions) at this year’s Quilt Festival. My first afternoon I felt as though I was all thumbs or maybe no thumbs! The second afternoon I was starting to fell much better about the process. Think I’m getting myself ready for a day-long marathon. This is really very fun. My very favorite Golden Acrylics were used as the medium. I used the Heavy Body, the Fluid and the new High Flow acrylics. The different formulas work very well together. Beautiful colors and great to work with. These prints were all done on paper. Did a test on some thin cotton. Think I’d prefer a more substantial and tightly woven broadcloth. Will keep you posted on the fabric results.